Wednesday morning, I dropped my wife off at work and headed out to scoop poop from homes in Radcliff, Fort Knox, Brandenburg, and Vine Grove. It was a chilly 15 degrees Fahrenheit that morning. My fingers felt like they were going to fall off. When I arrived at the first yard, I expected the dogs to rush the gate to greet me. I was surprised they didn’t. I brought with me three Antioxidant Health Bars from Life’s Abundance. I offered one to Dakota and he happily ate it. The other two dogs, Tiger a brindle pit bull and Cece a chihuahua mix were cuddled together to keep warm. At a distance, they appeared to be laying on the frosty green grass. As I approached them to offer them a treat, they leapt up and came toward me. It was then I noticed a remarkable thing. 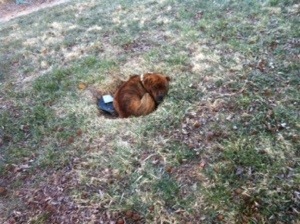 The two dogs had been cuddled together in a small hole. This was a hole that had been in this yard for years. Other dogs had dug the hole. These two found shelter and warmth from the wind as they cuddled together in the hole. The fascinating thing is that they had a physical structure for shelter but they chose to cuddle together. Tiger returned to the hole after eating his treat. I managed to get a photo of him as he rested. Dogs are smarter than you think. My dog is one of the most complex people I know. He gets mad at me when I leave and ignores me until he thinks I’ve learned my lesson. Only then will he look at me again.